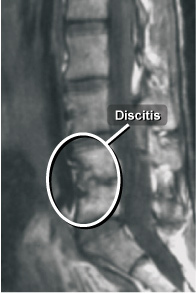 Discitis, or disc space infection, is an inflammatory condition that affects the intervertebral disc space located between two vertebrae, or bones, of the spine. Characterized by the slow onset of severe back pain, discitis is most often seen in children under 10; however, adults may develop the condition, as well. Discitis, or disc space infection, is an inflammatory condition that affects the intervertebral disc space located between two vertebrae, or bones, of the spine. Discitis may be caused by a bacterial or viral infection, or other inflammatory processes such as those associated with autoimmune disease. The condition most commonly affects the discs in the lumbar (low back) and thoracic (middle/upper) portions of the spine. Discitis can be very painful; the pain also tends to be aggravated by movement of the spine and often radiates to other parts of the body such as the abdomen, hip, leg or groin. What Are The Symptoms Of Discitis? Young children with this condition may act irritable and uncomfortable and refuse to sit up, stand or walk. The goal of treating discitis is to eliminate the cause of the inflammation and reduce the pain and other symptoms. Antibiotics, anti-inflammatory and pain relief medication and/or steroids may be prescribed. Bed rest and the use of a brace for immobilization and support of the affected area also may be recommended. A full recovery can be expected in cases that involve infection. In instances in which discitis has developed as a result of an autoimmune disease, recovery may depend on management of that disease, as most autoimmune conditions are typically chronic. Discuss your condition thoroughly with your doctor, and rely on his or her judgment regarding which treatment option is most appropriate.